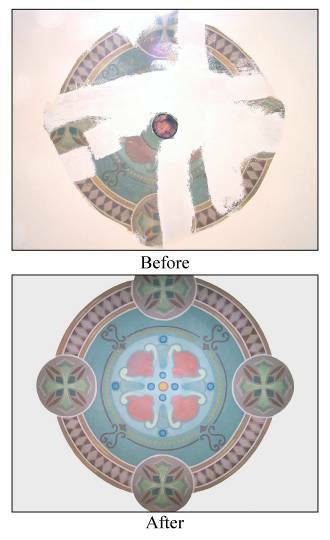 This painted ceiling ornament had suffered major cracking, fading and there used to be a light hanging from the center which was no longer going to hang there. After Henning Restorations repaired the cracks and hole. I restored the ornament back to its original design and color. In cases were a church would like to bring back a mural, painting, decorative element, or symbol that has been lost or destroyed. I have worked from old photo’s or a verbal description.